There are a number of rules when it comes to this blog. They include the requirement to write once a week, to have spent money in any place I write about, to be positive and to be honest. Simple enough rules, but in order to remain positive and honest I had to give myself a get out, a way of not offending those bookshops visited that may not make me happy enough to deserve a write-up. Admittedly, in the nearly two years this blog has existed such instances of unhappiness wouldn't even require the fingers of one hand, but given I'd rather be silent than negative there has to be a plan. My plan is to turn up unannounced. Generally I'll introduce myself at some point, but if I'm not expected my visit is more accurate than if I'm welcomed (or shunned) and it's a lot easier to leave in the rare instances of unhappiness. The trouble with turning up at bookshops unannounced, is that you can't check if the booksellers you hope to meet will actually be there at the time of your visit. 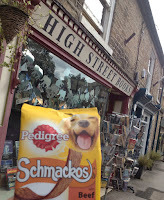 And so it really wasn't too surprising last Saturday when I arrived at High Street Books in the Peak District to discover the bookseller (and equally importantly their bookselling hounds) were on holiday. I'd even bought treats in an attempt to bribe the dogs into being my friends. All of which should've left me feeling rather disappointed. And maybe I was, a little. But it's hard to be upset when you're in the middle of your first proper visit to Derbyshire and it's absolutely beautiful. The drive had been stunning. From the moment I passed the county sign the countryside was overwhelmingly gorgeous. 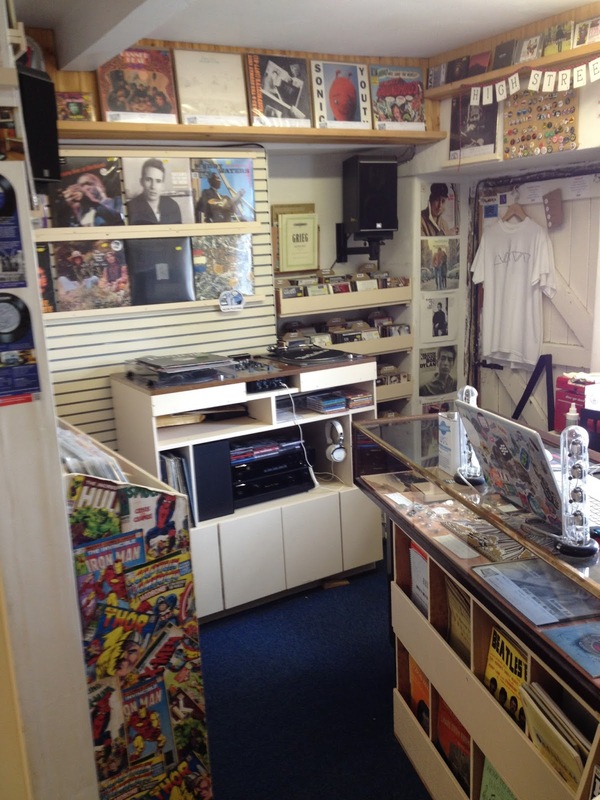 Throw in a shop full of books and music and it's hard to be anything but happy. 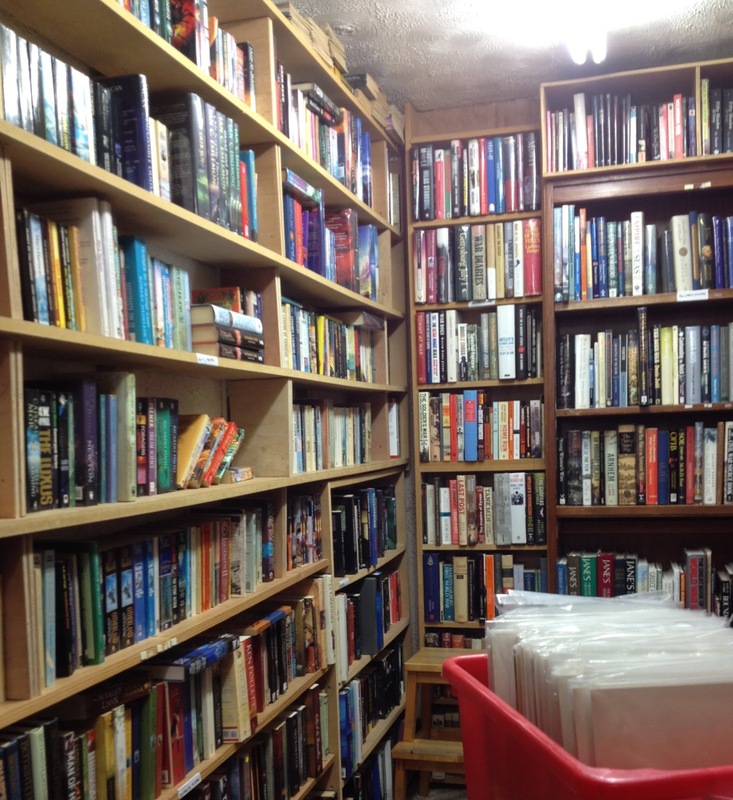 Initially not wanting to accept the absence of the dogs, my first experience of High Street Books was to rush around every corner in the hope they were hiding, meaning my first pause for breath was downstairs in the music section of the shop. Split across two floors, music is in what I imagine classes for a cellar, but still manages to have a window to the outside due to the peaky nature of the area. It's bright and packed with vinyl for proper music fans, but equally welcoming to those of us who still appreciate a good CD, with me drawn to the options of Indie 90s, Manchester, and other such groupings. Selecting We'll live and die in these towns by The Enemy, I finally accepted the dogs weren't hiding under a record player and returned to the books. 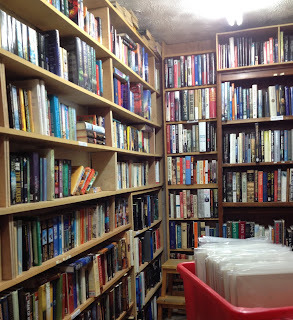 A relatively small, secondhand bookshop, High Street Books feels surprisingly well-filled and roomy for its size. There's a good mix of fiction and non-fiction, including a varied children's section, loads of classics and even sci-fi and fantasy. Three or four people were wandering around without us tripping over each other too, and all in the space of roughly one room of what looked to have formerly been a Victorian terraced house. Were the dogs also there I imagine things would've been a little more cosy, but as it stands I can't fault my visit. In the absence of the bookseller I spoke to the guy from the music side of the premises, who'd kindly invited me back two days later to meet the dogs and their human. Even without being able to immediately accept the return invitation, it was a lovely interlude in the middle of a long journey and one I'm determined to repeat in the form of a proper holiday to explore the area at a later date. Meantime, the bookshop had one final treat to ensure I left happy: my book purchase. 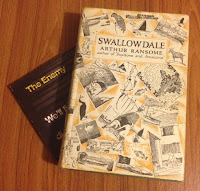 Readers of Other People's Bookshelves will know of my quest to read the Swallows and Amazons series in order, and thanks to High Street Books I'm now the proud owner of the second book in the series: Swallowdale by Arthur Ransome. PS In case you're wondering, I didn't leave the dog treats at the bookshop. They came home with me as a gift for the office puppy. Instead I'll take fresh chews next time, when I'll have the sense to agree a good time to visit the High Street Books hounds. I really like this idea of trying to get to independent bookshops and making a trip of it. I did a bookshop crawl recently for Independent Bookshop Week and thoroughly enjoyed it and am now trying to make sure I continue to visit the shops from that. This one sounds like a good one. 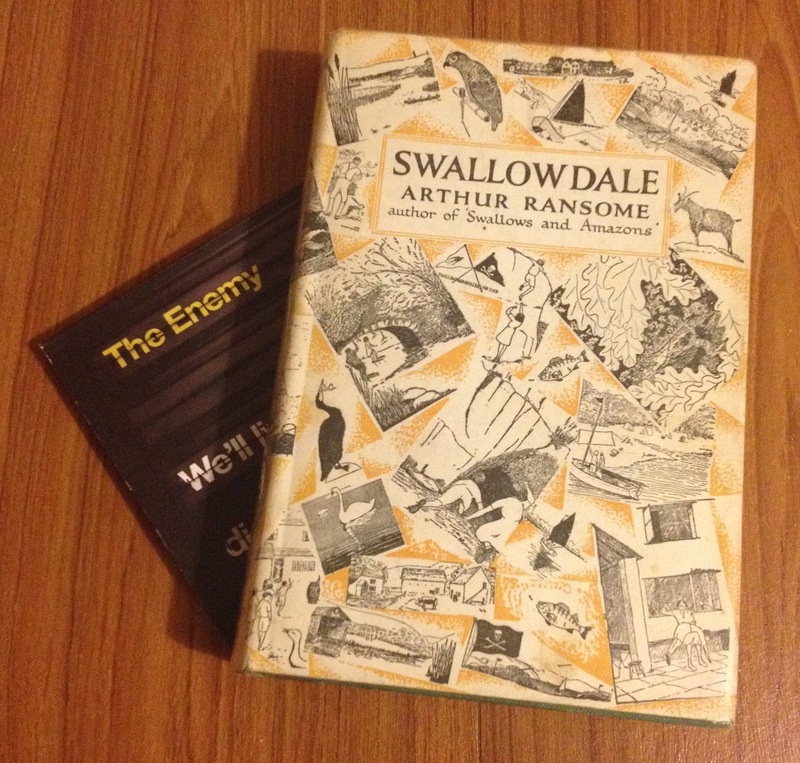 And I can't fault a shop that has Arthur Ransome books. I read all the Swallows and Amazons series when my Dad gave me his copies but I've since made sure to get my own set and they're my go-to comfort read. I read one of them most years. It's always good to hear from people who appreciate independent bookshops as much as me, I'm glad you enjoyed your IBW crawl too - did you write about it? I'd love to see (my write up was posted here in June). As for Swallows and Amazons, I only managed to read three or four of them as a child - with the first still being a favourite - so it'll be a real treat for me to eventually collect them all!